32 no. : ; 28 cm. HS-1 (Nov. 1936)-HS-32 (June 1939). summer, supplies will be larger than the small marketing last summer. higher than a month earlier, but nearly $2.50 lower than a year earlier. with the very suall storc'u-. stocks now on hand. will be dizcussedl in detail in the July issue of the Hog Situation. for the week ended June 11 was $6.63, coapored with about $7.50 in early T,1y. 1/ Bureau of Animal Industry. 3/ Totals of unrounded figures. pork and lard on June 1 wore 284 million pounds smaller than a year earlier. approximately 1.8 million head of ,i-ogs of average market weight. ;Mil.lb. Mil.l. Mil. Mill illb. Mil.lb. Mil. b.
of refined lard at Chic-go was the lowest for any month since July 1934. October, but prices of cured pork in :ay-r were lower than in March. relatively small, seldom exceeding 1 million pounds per month. 3 million pounds to Cuba. woro considerably smaller than those f March. 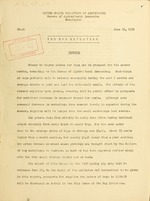 from the May issue of this report is given. will be affected by the number of sows and gilts retained for fall farrow. considerably --rCcr than in the present marketing year. appears probable in view of the expected seasonal reduction in marketing. continued weakness in consumer demand for meats. the fall and early winter probably is expected to be relatively great. the sharp drop that occurred last fall. Loins, 8-10 lb. .....: do. 10-12 lb. ......... : do. dry cured, 6-8 lb. ..: do. H. W. tubs .......... : do. 2/ Number of bushels of corn equivalent in value to 100 pounds of live hogs. / Monthly figures computed from weekly averages. : Oct. Sept. : Oct.- Apr. Imports of pork /: do. / Bureau of Animal Industry. and fresh, canned, and picklcld pork. Lard includes neutral lard.